I am so excited to have the fabulous Thaila Skye as a guest poster for OstoMYstory! Thaila is an amazing advocate for ostomates. She had surgery in 2010 and later started blogging and has a very active YouTube channel with tons videos on living with an ostomy, reviews of products, as well as talking about health and fitness. Her OstoMonday series is great! (Links to everything below.) 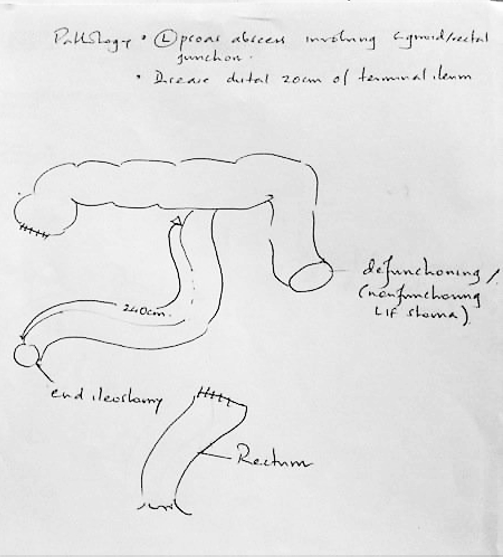 So thank you, Thaila, for sharing your story on The Stolen Colon! 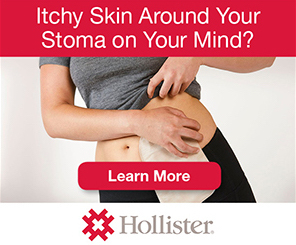 Having a stoma can be difficult at times. But having two stomas? Yep, that’s definitely twice as complicated. I remember when the stoma nurse visited me before my operation, where they prepare you for what’s going to come. “You might wake up with one bag, you might wake up with two, we just don’t know yet.” Great, that’s exactly what a 24-year-old woman wants to hear. She marked X on my right-hand side, and then another X on the left-hand side. Y’know, just in case. I woke up in the recovery section of the colorectal surgery ward. It wasn’t just one bag. It wasn’t even just two bags. When I looked down under the sheet for the first time, it was like I was hooked up to the Matrix. Of course, when I first woke up, I didn’t know what any of these things were. I had been so out of it from septic shock when the nurse and surgeon had been explaining everything to me that I had really no idea what was going on, or what they were going to be doing. It was a week before I got the courage to ask my consultant, “so what have I got on the inside, now?” He looked at me with a confused look on his face, as if it was the most ridiculous question he’d ever heard. But it wasn’t a ridiculous question. They’d been in and moved things around and taken things out, and I didn’t even know what was where anymore. He crudely sketched out my new anatomy for me, and I finally understood how I worked. 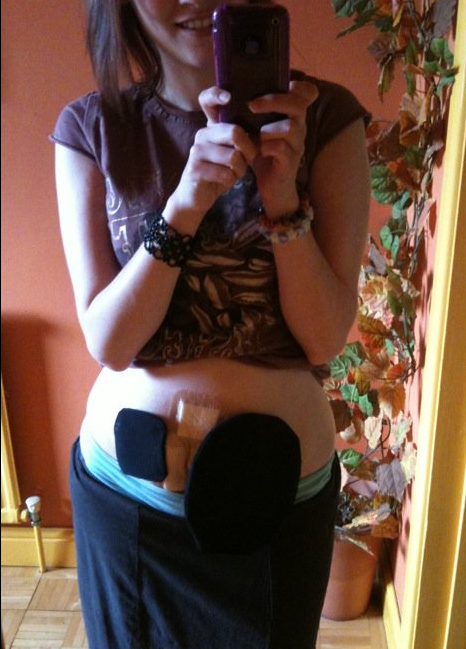 I was finally able to name my stomas, and they became affectionately known as Stan (ileostomy) and Colin (colostomy). Of course, it means twice as many ostomy supplies, twice as long to change my bags, twice as many chances of leaks… and it took a while to manage them both. In hindsight, I’d have preferred them to have just removed the whole colon instead, rather than just leaving a bit of healthy bowel in there, as Colin can be rather inconvenient sometimes, as it’s not stool but mucus, and it’s very difficult to predict when it’ll come out. Saying that, I’d prefer not have any more surgery if it’s not life-threatening, as it’s rather a lot of hassle. I do love Stan and Colin. It sounds silly, sometimes, especially if I’ve had a difficult bag change or some unexpected sore skin or, even worse, a leak. But they really did save my life, and now I think I’d actually miss them if I didn’t have them anymore. You can keep up with Thaila on: her YouTube channel, her Blog, Facebook, Twitter & Instagram. 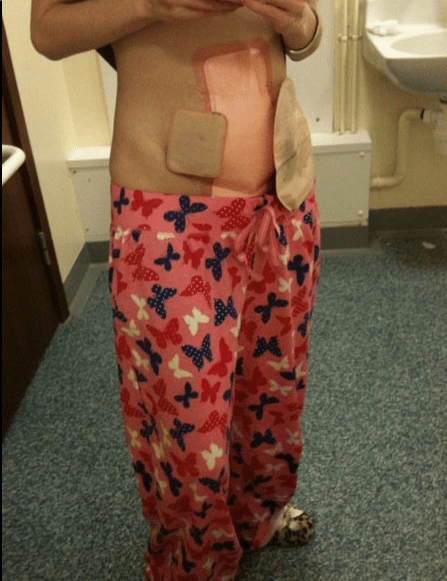 This entry was posted in Guest Post, Ostomy, OstoMYstory, Stolen Colon, Surgery, Ulcerative Colitis and tagged colectomy, colon, colon bag, colostomy, Crohn’s disease, health, hospital, IBD, ibd blog, ileostomy, ileostomy bag, ileostomy blog, life, ostomy bag, ostomy blog, stoma, surgery on January 27, 2015 by Stephanie Hughes. I am still getting use to my colostomy. I got it 1-15-15. I have not tried all the different bags. I got some free samples but I ‘m still using the ones they gave me in the hospital. So far it is ones with the drain and they are attached to the wafer with a Tupperware closing. They wanted me to change them twice a week for the first 2 weeks. And I am not to eat any raw fruits or vegetables for the first 2 weeks. I was given some nurses names who I could contact if I was having problems so I wouldn’t have to go all the way back to Rochester. Last night I had a blowout. I hadn’t checked my bag as close as I should have. Luckily I was at home when it happened. I know now what can happen. I will check more closely and keep a spare bag with me at all times. I’m recovering from another stoma operation, at the beginning of August I went to the local A&E ward complaining about a blocked stoma and after everything else failed to shift it the surgeons decided to operate. 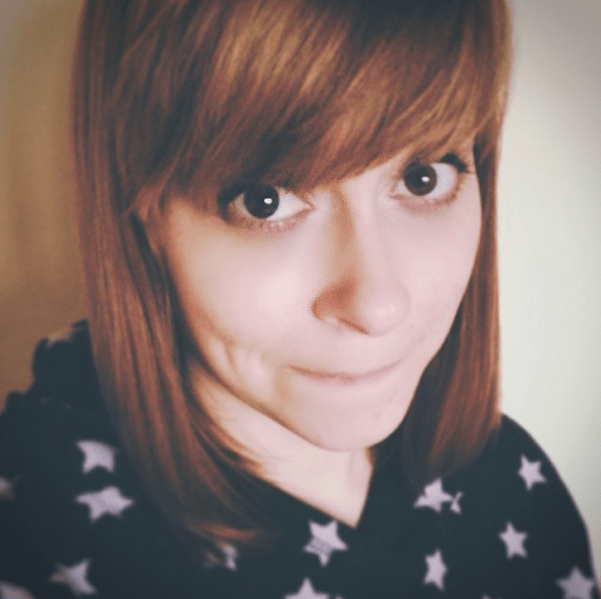 I ended up with 3 operations in 3 days to try to correct my existing stoma but there were some complications so it took longer than they expected. Of course I knew very little of this, I remember the surgeon talking about the laparotomy and me asking for a ‘six pack’ – but apart from that anything I was told didn’t register due to the painkillers I was on. I had to ask the surgical team and my wife what had happened and got the full picture after I came out of Intensive Care. I can’t complain about the procedures or the staff looking after me they were all great and I’m extremely grateful to still be alive after it all.